We would love to have you join us at the D&D Spring Market. On May 15 2014 at 11am, we have an exciting and innovative presentation. Come along to see unique and stylish ways to integrate the latest technology into your home! The D&D spring market schedule is a jam-packed, two-day event with more than 30 showroom programs and informative events. If you’re in or around New York City, we’d love to see you at this unique and special event. Save the date! Add it to your calendar now. Perfect for luxury high rise urban living spaces as well as complimenting the modern home. The Metro Frames Collection is available in a variety of profiles as well as finishes for contemporary minimalist spaces where less is more. A framed TV provides an elegant, finished look, as well as hiding those unwanted cords and cables. You can choose from 1000’s of different artwork that will turn your TV into a masterpiece that will wow your guests. It’s a real conversation starter! Another popular option is to cover your TV with a framed mirror to create a stunningly beautiful centerpiece that compliments any room. Visit our website to design your very own framed TV. New website launch provides inspiration. Ideas to prevent the TV taking over your room. With the price of flat panel TVs becoming more affordable, many home owners are now discovering that these large black screens are dominating the room when not in operation. Instead of the room decor catching your eye, the blank TV has become the main focus. This dramatically ruins the atmosphere you went to so much trouble to create. A visit to the Lowell/Edwards newly launched website http://lowelledwards.com reveals numerous innovative and stylish ideas to disguise your TV. We offer many options to compliment the design and decor of your home. Custom motorized pop-up TV cabinets. 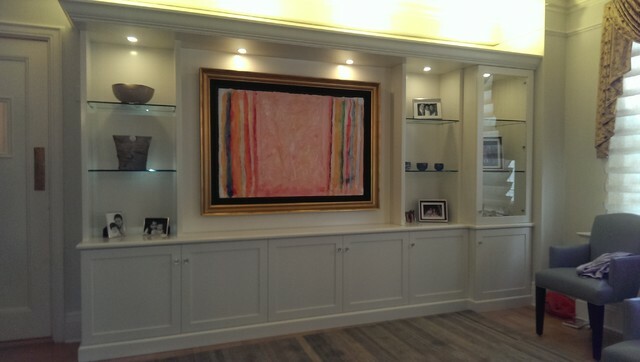 Flush mount picture frames with artwork that retracts to reveal the TV. A mirror that conceals TV behind it. These are just some of the inspiring designs that you will see on our new website. In addition to inviting you to visit their new website, you are cordially invited to visit the Lowell/Edwards showroom in Hackensack, NJ. Here you will be able to view these unique options in person as well as discuss your individual requirements with a member of their design team. Lowell/Edwards was Formerly located for over 20 years in New York City’s world renowned D&D building. They are one of the nation’s leading custom home theater, home automation and custom cabinetry designers and installers. Lowell/Edwards represents the following Product lines in the New York, New Jersey and Connecticut area. Autonomic Controls, Cinema Tech Seating, Crestron, Denon, Fortress Seating, Frame My TV, KEF Speakers, Leon Speakers, LG, Lutron Serena, Lutron Radio RA2, Lutron QS, Middle Atlantic Products, NAD, NAD Master Series, Onkyo, PSB Speakers, Runco, Sonance, Speaker Craft, Stewart FIlmscreen, Samsung, Seura Mirror TV, Toshiba, Triad Speakers, Vutec ArtScreen. Welcome to Lowell/Edwards Home Theater/Automation and Custom Cabinetry Blog! Welcome to the Lowell/Edwards blog! Lowell/Edwards can help you with sound proofing, beautiful cabinetry, motorized seating, lighting control, touch screen remote controls, motorized shades as well as ingenious ways to hide your TV. At Lowell/Edwards we can provide a tailored custom to suit you and your lifestyle. No project is too big or small. Both residential and commercial projects are welcome. We use only superior products paired with custom designed systems that are professionally installed by our highly skilled installation team. In addition, our customer service coordinator will schedule any service as needed in the future. We offer top-notch, fast response customer service. We also take pride in getting the job done right the first time. With over 20 years in business, we have the knowledge and experience you’ve been looking for. We are known for having an eye for perfection. Review a list of our product lines on our website.